Staubzucker wins 3 Gold Medals in 3 categories (Classical Contemporary, Album, Creativity and Originality) at the Global Music Awards in California. Personality of the Year in arts and creativity, Swabia, Germany. Award of Excellence & First Prize at WPV Convention Athens. Patron of the “Hearts of Gold Awards”, Cyprus. Ambassador in Tourism – Honorary title awarded by the Cyprus Tourism Organization. Golden Apple and First Prize for AUTOSYMPHONIC – EVA Award for Innovation in the category “Public Event” of FAMAB Germany (Association for Direct Business Communications). Johnnie Walker Man of the Year in the category “Arts and Creativity” (nomination). 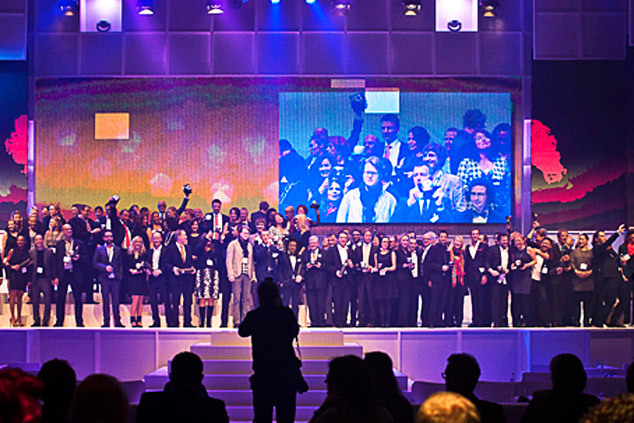 Marketing Prize of Rhine-Neckar Metropolitan Region in the category “Business to Consumer” for AUTOSYMPHONIC. Prix International Luigi Russolo awarded by the Russolo-Pratella Foundation, Varèse (Italy) and Studio Forum d’Annecy (France). First Prize of the Society for Arts and Critics Leipzig in co-operation with the Bach Archive Leipzig at Hof Klang Festival, Leipzig. 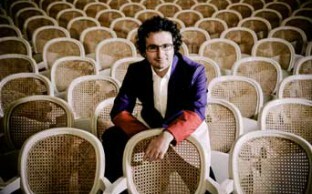 First Prize at International Counterpoint Festival for New Music in honor of Luciano Berio in New York. 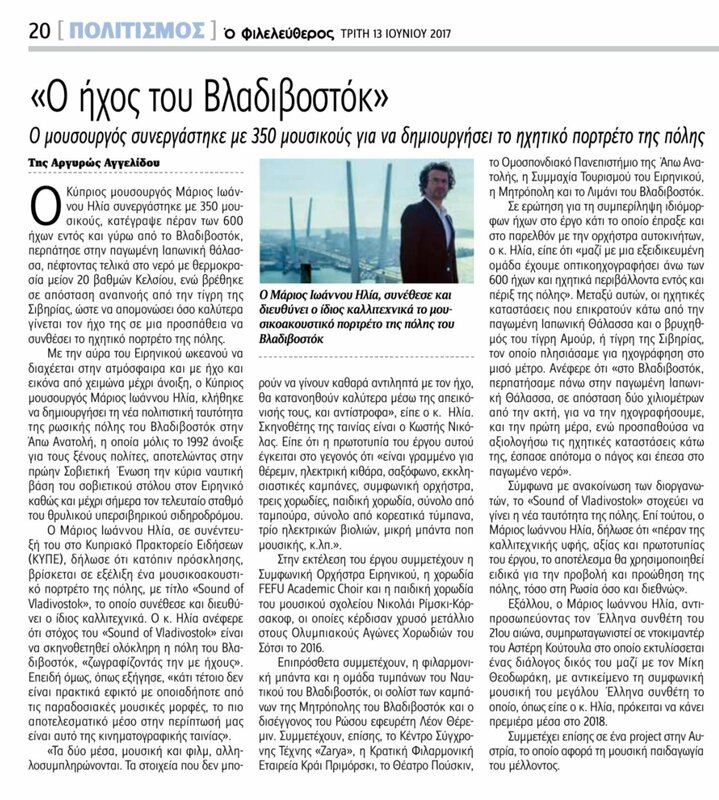 Artist of the Year in Cyprus awarded by Politis News. Honorary Achievement Award under the patronage of the Minister of Education and Culture of the Republic of Cyprus. Akademie Schloss Solitude Fellowship, Stuttgart. DHV German Harmonica Association Composition Prize Fellowship, Trossingen. Otto Mauer Foundation Composition Prize Fellowship, Vienna. University of Music and Performing Arts Vienna Research Prize Fellowship (on polymediality and polyaesthetics in contemporary music). First Prize and PWM Edition’s Special Prize at Kazimierz Serocki International Composer’s Competition in Warsaw under the patronage of the Minister of Culture and National Heritage of the Republic of Poland. First Prize and Special Jury Prize for STAUBZUCKER and APOPHIS (performed by Miscelanea Guitar Quartet) – International Competition for Interpretation of Contemporary Music, Salzburg. Sichuan Conservatory of Music Composition Prize, Chengdu (China). Hanne Darboven Foundation Composition Prize Fellowship, Hamburg. Kunststiftung Baden-Württemberg Composition Prize Fellowship, Stuttgart. 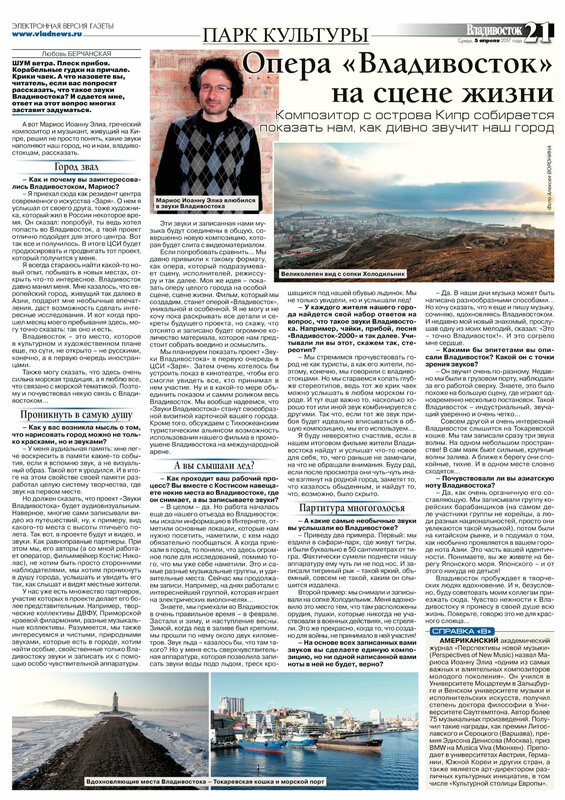 First Prize at Edison Denisov International Composers Competition in Moscow awarded by the Union of Composers of the Russian Federation under the patronage of the Russian Minister of Culture. First Prize “Recherche” for Composition awarded by the Mozarteum University of Salzburg, “Klangspuren” Festival for Contemporary Music, Tyrol and Ensemble Recherche, Freiburg. 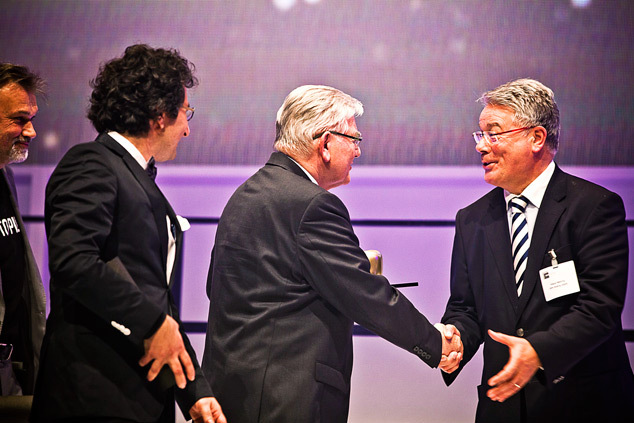 Theodor-Körner-Fonds Composition Prize lauded by the President of the Republic of Austria, Vienna. Austrian Federal Chancellery (Arts Section) Composition Prize Fellowship, Vienna. 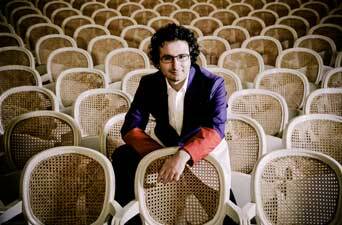 “Frederic Mompou” International Patronize Award of Joventuts Musicals de Barcelona. Junge Akademie der Künste Composition Prize Fellowship, Berlin. A.G. Leventis Foundation Research Prize Fellowship (on polymediality and polyaesthetics in contemporary music), Paris. Composition Prize of Hamburger Klangwerktage – Festival for Contemporary Music, Hamburg. Audience Prize at International Music Today Festival awarded by the Korean Society of the 21st Century Music, Seoul. Allianz Cultural Foundation Composition Prize Fellowship, Munich. First Prize at Viennese Summer Seminar for New Music. First Prize at “Savarez-Corelli” Chamber Music Guitar Competition for ONTOLOGIE KUBIK (performed by Tosidis-Nousis), Salzburg. BMW Patronize Award of the Bavarian Broadcasting and Musica Viva Concert Series for New Music, Munich. Hellerau – European Centre for the Arts Fellowhip, Dresden. 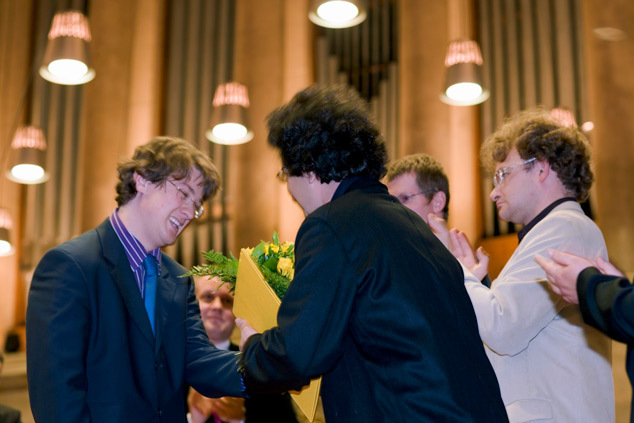 First Prize – Lutoslawski Award of the Witold Lutoslawski Society and Polish Composers’ Union, Warsaw. Yannis Papaioannou Composition Prize of Greek Composers Union, Athens. State Grant for Composition from the Austrian Federal Ministry for Education, the Arts and Culture. Chancellor’s Award for Excellence of Mozarteum University of Salzburg. Achievement Grant Award (“best student”) by the Austrian Federal Ministry for Education, the Arts and Culture and Mozarteum University of Salzburg. 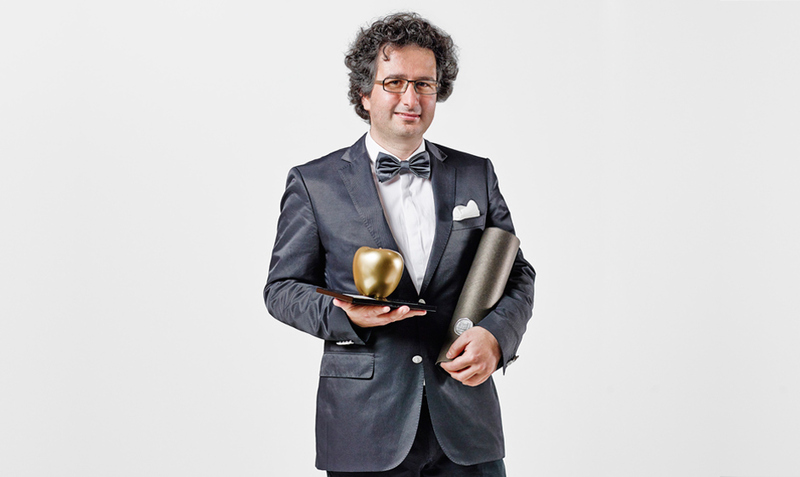 Acclaimed by The Huffington Post as “One of the world’s more remarkable symphony concerts”, Marios Joannou Elia’s AUTOSYMPHONIC won the prestigious “Golden Apple” 2012 in the category “Public Event” – awarded by FAMAB (Association for Direct Business Communications), Germany. The thirteen-member jury unanimously voted for AUTOSYMPHONIC highlighting the exceptional and unique use of the 80 automobiles as musical instruments within the symphony. 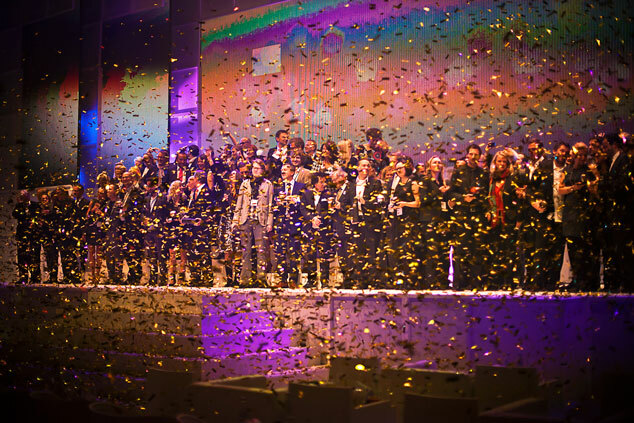 According to the Jury: “The whole world loves automobiles; the whole world loves music!”. 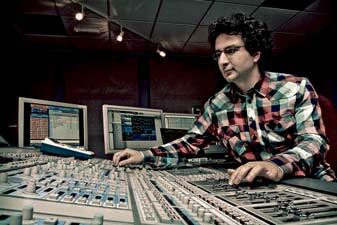 Marios Joannou Elia’s AUTOSYMPHONIC received the prestigious EVA Award before an audience of 1,500 prominent guests. This is Germany’s most important prize in the “Pubic Event” category. Marios Joannou Elia (left front) – together with the production team of AUTOSYMPHONIC (Michel Maugé, CEO of m:con-mannheim:congress GmbH, and Horst Hamann): Winner of First Prize and the 2012 Golden Apple of FAMAB Germany. 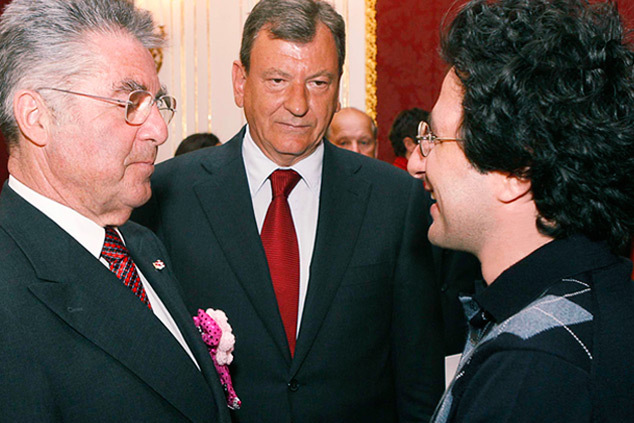 The President of Austria, Heinz Fischer (left) congratulated Elia at Hofburg Palace in Vienna after he was awarded the Theodor Koerner Prize (2007). The prize-giving ceremony took place at the Main Ceremonial Chamber of the University of Vienna; the prize was awarded by the President of Austrian Chamber of Labour (center). 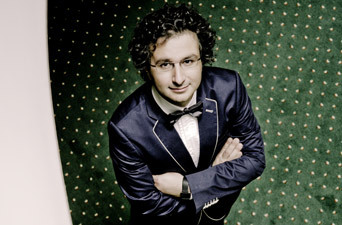 In 2005, Elia was awarded the BMW Patronize Award of the Bavarian Broadcasting and Musica Viva Concert Series for New Music. 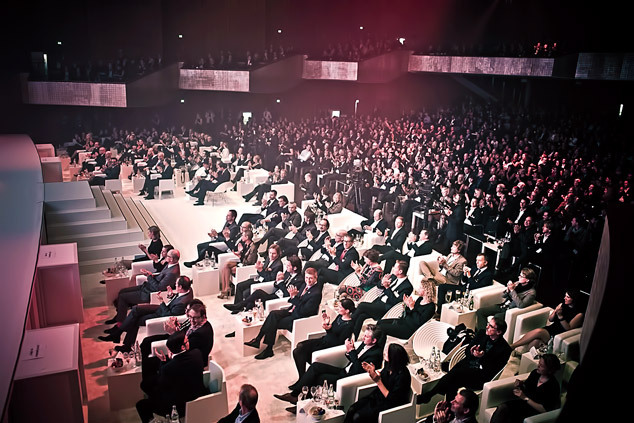 The Awards Gala took place at the Herkulessaal der Residenz in Munich. 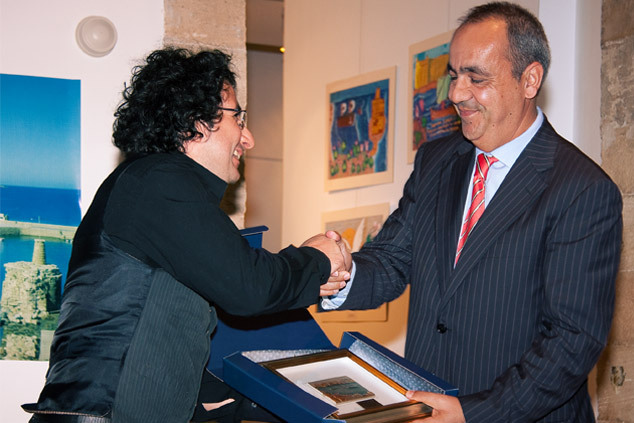 The Mayor of Paphos (representing the Minister of Education and Culture of the Republic of Cyprus) presented the Honorary Achievement Award to Marios Joannou Elia, “in recognition of his outstanding accomplishments as an artist” (2009).